Few, if any, can live up to the honors that have been bestowed upon Margaret Thatcher. The "Iron Lady" took what was intended to be an insult and turned it on its head. Her strength and grace was truly amazing. The daughter of a grocer, her story of personal success is inspirational. Without her, and her (oft derided) middle-class sensibilities, does anyone believe that the Berlin Wall would have been torn down in 1989? 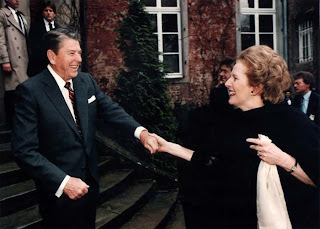 No, it was only through the shear force of will of Lady Thatcher, President Reagan and Pope John Paul II, that the evil of the Soviet Union was fully exposed and its utter unworkableness proven. COAST joins the world today in mourning the loss of Lady Thatcher, but we are contented to know that she is enjoying the fruits of her labors in the sweet hereafter. We close with one of her most memorable lines (one that Mayor Mallory and Roxanne Qualls would do well to remember): "The problem with socialism is that you eventually run out of other people's money."